Design and operational effectiveness of systems, policies and procedures which support HR management, specifically: employee recruitment, performance management, employee relations (including sexual harassment, exploitation, and abuse), and separation. The OIG audit report produced five Agreed Management Actions, which are detailed in Table 1 at the end of this article. The People Strategy, i.e. the HR corollary to the Global Fund Strategy 2017-2022, is held up as a “key achievement” by the OIG. This review seems to center on the fact that the People Strategy was developed through a strong consultative process, and includes, “defined activities, deliverables, KPIs and timelines….” While performance management was not an individual component of the original People Strategy, it was added in mid-2018, after or near the close of the OIG’s audit period. Despite frequent references to it, the OIG report contains only a modest explanation of the People Strategy, which according to the OIG is an internal document and not in the public domain; the GFO was therefore unable to obtain a copy of it. Another “key achievement” for HR management was the HR Transformation Project—a component of the People Strategy. The transformation involved restructuring of the HR department and approach, with “improved processes and systems” to provide more streamlined support for employees, such as through “self-service” capacity where appropriate. The implementation of a user-friendly HR technology platform, Workday, was also part of the transformation, as was the outsourcing of payroll services. These changes, and the decrease in the number of Secretariat HR personnel from 27 to 22, have contributed to annual HR department savings of $800,000. At the same time, average staff-satisfaction ratings improved between 2017 and 2018. The OIG report identified three major areas considered “key issues” or “risks”, which are summarized below, along with the associated Agreed Management Actions (AMAs). Only 2% of staff reported that they think the Fund takes appropriate action when dealing with poor performance. Thus management of poor performance is a widespread concern among employees. Performance Support Plans (PSPs) are vastly underutilized to correct poor performance, with less than half of all poor performers being assigned to such plans in recent years. As of 2018, all employees who have a rating of ‘some issues’ or ‘serious concerns’ from their 2017 performance cycle must complete a PSP. A misunderstanding of the constraining power of legal frameworks on the ability of managers to manage poor performance. The Administrative Tribunal of the International Labour Organization (ILOAT) is regularly cited by Global Fund management as the basis for the Fund’s “low appetite for legal and reputational risks,” according to the report. However, the OIG found limited evidence for such conclusions, based on the outcomes of actual cases brought before the Tribunal—involving other employers and having to do with poor performance. People managers are not adequately trained on how to tackle poor performance. The trainings available on people management have low participation by staff, are not appropriately tailored to seniority, and are poorly rated by those who do participate. In response to this finding and in accordance with Agreed Management Action 1, the Secretariat will study the recent external performance and talent management review results and update policies and systems accordingly. The Secretariat has also committed to expand and “further embed” training for people managers and monitor their practices related to performance management. The second major area of concern for the OIG regards the scope, articulation, and practice of policies related to employee relations, including dispute resolution procedures, management of disciplinary case data, and sexual harassment, exploitation, and abuse issues. The OIG noted that just after its assessment period closed in June 2018, the Secretariat began implementing a stronger system for employee dispute and grievance resolution. However, a lack of comprehensive employee relations policies and guidelines still presents a risk that the Fund may be in non-compliance with ILOAT norms. In particular, there are “deficiencies in the management of employee relations data.” The OIG highlighted that data on employee relations cases was being inefficiently tracked and stored, and that records were only being kept for 12 months or less (except for cases involving gross misconduct, which are filed permanently); this presents a risk to the organization, should a separated employee pursue action against the Fund. As Agreed Management Action 2, the Secretariat will clarify roles and responsibilities for employee relations management and dispute resolution, and review its practices related to disciplinary case data management. Regarding sexual harassment and sexual exploitation and abuse (SEA) issues, the OIG found that the Fund has been proactive and effective in tackling the issue – from a policy standpoint – and in updating policies and procedures for the management of these issues as they arise among Secretariat staff. However, the OIG noted, these policies do not currently extend to the wider Global Fund universe of “implementers, suppliers and other stakeholders….” The OIG suggested that such policies be adapted for application to external stakeholders. The third area identified as a “key issue” was the delay in implementing Strategic Workforce Planning, the importance of which had been identified in 2012 but had been deprioritized until the 2017-2022 People Strategy had been developed. Strategic Workforce Planning identifies and puts in place the appropriate organizational design for organizations, with the right skills and competencies to match. The 4th and 5th Agreed Management Actions associated with this audit relate to the Secretariat’s commitment to implement Operational Workforce Planning (AMA 4) to inform the 2020 budget, and Strategic Workforce Planning (AMA 5), “to enable strategic scenario planning, statistics and budgeting.” AMAs 1-4 are all scheduled to be completed by December 2019; AMA 5 by June 2020. All AMAs are owned by the Head, Human Resources Department, Partick Nicollier, except AMA 3, which is owned by the Chief of Staff, Marijke Wijnroks. 1. The Secretariat will review the results of the performance and talent management review by Deloitte and update performance and talent management policies/processes and systems. The Secretariat will further embed current practices including mandatory training (e.g. Performance Support Plan training, competencies training and leadership training) and monitor the evaluation of line managers (e.g. Ongoing inclusion of mandatory people objective in performance objectives of line managers). Define the overall deployment approach, project plan and tool for Operational WFP. Lead the pilot for the selected Division and integrate lessons learnt. Build the multi-stakeholder governance and process to embed operational workforce planning into standard HR/Finance planning cycles. Build the change management plan and related communication/training material to equip employees. Deploy the operational workforce planning tool and facilitate the workforce consolidation, analysis and action plans. Confirm the case for SWP and selection of the SWP methodology (tool and process) and pilot. Update the governance and process maps. Update the change management material (communication/ training material) and project plan. 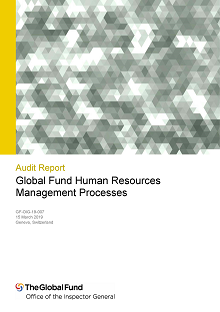 This audit report, accessible on the Global Fund website, is 'Global Fund Human Resources Management Processes', 15 March 2019 (GF-OIG-19-007). Editor's note: The 2015 OIG audit of Global Fund Human Resources is not currently available on the Fund's website.